Eyesight is priceless, so the state of the visual apparatus checks as soon as the baby was born. Again – in six months, then in three years, and pupils annually. Adults from the age of 20, if problems with eyes, AMI no, you're supposed to visit the optometrist every two years, after 65 years of age annually. 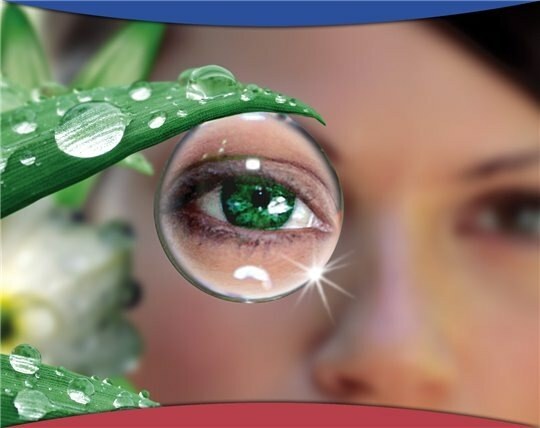 The monitoring view allows you to detect eye diseases in time. Especially such serious as retinal detachment, glaucoma, optic nerve atrophy, cataracts that threatened blindness. Vision screening begins with an external examination of the ocular apparatus. Optometrist (more modern title of specialist in eye diseases ophthalmologist) determines the state of the eyelids, cornea, iris, pupil, etc. Then we will examine the sharpness of distance vision. Doctors traditionally use the table Sivtseva. It either hangs on the wall or projected on a white screen. This table consists of 12 lines of different letters from large to very small. Twenty feet from her chair. You offer to sit, and to call specified doctor of letters: large, then smaller and smaller. First check the visual acuity of the right eye while you close the manual shutter of the left eye. Then Vice versa. Every line is 10% visual acuity. If you clearly see the letter of the tenth line from the top – you have full vision (of 1.0 unit). The eleventh and twelfth lines are usually well distinguished, characterized by farsightedness. If you see less than ten rows, then the doctor selects or glasses or contact lenses. He wears you to the spectacle frame with grooves, which alternately inserts a few lenses. The degree of vision correction with their help determined by reading the rows of the table Sivtseva. From the several options you choose the one that produces the maximum number of clearly visible lines. It is important to avoid discomfort from prescribed lenses. If the eyes are "cut", they are watering, the picture "ghosting", or you have a headache, slight dizziness, tell certainly. The doctor will choose the lens with less diopters. Glasses should always be a little "weaker". Children who cannot read, vision is tested or on the table Golovin, which depicts the decreasing rings with slits in different directions, or the grid Orlova pictures. On them and choose either glasses or contact lenses. Near vision ophthalmologist checks, offering to read short texts on the card, which also differ in the size of the font. To read these lines should be holding the card in front of him at a distance of 35 cm. If the vision is very weak and the patient will not even see a huge letter of the first line "sh" and "B", the optometrist determines the visual acuity on the fingers. He shows the patient a different number of fingers on your hand, gradually moving away from him. And the result determines the distance from itself to the patient. Modern eye clinic is equipped with electronic optical devices which determine the visual acuity instantly, and not empirically, by tables, and automatically. To deceive them is absolutely impossible. There are people for which, for example, red and green are one and the same. Correct vision optometrist determines the Atlas with colored optical tests. They consist of dots and circles, out of which only "lurking" numbers or geometric shapes. The doctor offers to call them. If the patient sees them or sees other figures and shapes, then he is colorblind. It is very important to also check the fundus. The doctor digs in both eye drops, pupils are soon greatly enlarged, and he well illustrated the condition of the retina, blood vessels, macula. If there is pain, "floaters" or the fiery circles in the eyes, the outlines of objects seen vaguely painful to look at light, immediately contact the optometrist. Sometimes for the salvation of man from blindness every hour is crucial! Special preparation for examinations is not necessary. But you should know that sleepy state, fatigue, alcohol, adopted in a day or two before, may affect the objectivity of the results. Also, before it is advisable to take any medication. More and more people began to spend time in front of television screens and computer monitors. The gaze focused at one point and the eye muscles remain stationary, due to which vision gets fuzzy. In the event of a problem with visionm immediately go to an ophthalmologist. Thanks to modern equipment, the doctor will determine with precision the sharpness of your vision. To check eyesight, requires no special training. If you are using contact lenses or glasses, bring them with you. Some drugs can affect vision, so don't forget to tell the doctor about all the medicines you are taking. The sharpness of the distance vision test using a special table Golovin-Sivtseva, which is named in honor of ophthalmologists, who developed this method. The table consists of twelve horizontal rows of letters of different sizes. In the upper part of the large letters, each near the size of the letters decreases in accordance with a certain regularity. The table feature on the wall, the patient should be kept at a distance of six meters from her. Increasingly, instead of a table with printed letters use electronic projectors marks. These devices allow you to project letters, symbols, and other symbols on a screen located at a close distance. The patient is instructed to close one eye with a special valve and check the visual acuity for each eye. You must read the letters in each row. If you are able to read all the letters in tenth place, the sharpness of your vision and the ideal is 1.0. If you can identify the letters in the ninth line – 0,9; if only in the eighth – 0.8 and so on. To check near vision using a small card with printed text. Each paragraph is written with the letters of various sizes. To keep the text should be at a distance of 33-35 cm at eye level. If you have normal visionm has to read the whole text. 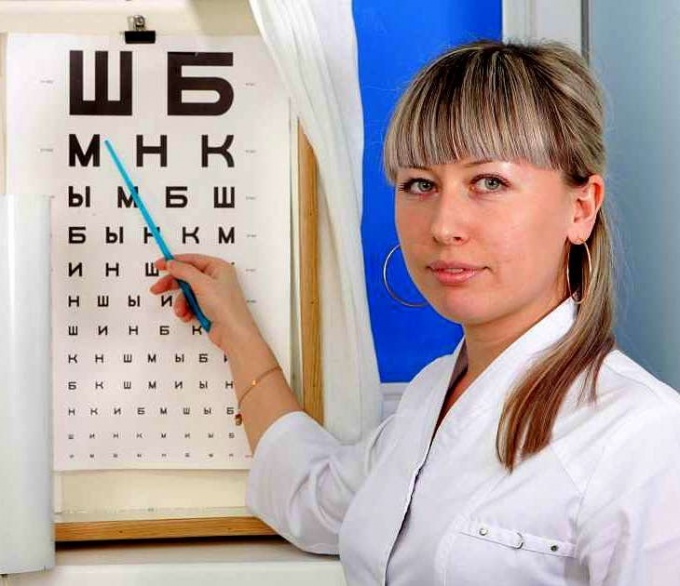 If you are not able to read even the largest letters in the table Sivtseva-Golovin, the doctor will apply another technique to check the visual acuity. At home to determine the visual acuity at the makeshift table, but very roughly, as it is impossible to meet all the requirements of the conditions of the study – contrast marks, the exact size of letters, illumination and so on.